HOLMES BEACH, Fla. - Mary Alice Chakoumakos passed away peacefully in her sleep at home on March 23, 2018, at the age of 91. Mary Alice was a resident of Holmes Beach, Fla. for 28 years, after having moved there from Farmington to retire with her husband Charles. She grew up in Litchfield, attended Bates College in Lewiston and, after getting married, lived briefly in New York. She and her husband Charles then settled in Maine (Bethel and Farmington) to raise four freethinking children. Mary Alice was active in the Maine Chapter of AAUW, The Town of Farmington Planning Commission, and the Roser Church of Anna Maria, Florida. Mary Alice was an avid reader, bird-watcher, bridge player, and math whiz. 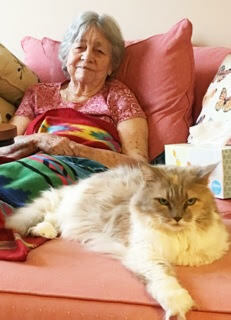 She loved a good cocktail, her own excellent cooking, and the perfect key-lime pie.She spent her final years in Santa Fe, New Mexico under the loving care of her Daughter Alison and the watchful eye of her faithful cat, Miss Kitty. Mary Alice is survived by her 4 children: Scott, Bryan, Alison and Andrew, 6 grandchildren: Sara, Segue, Rowan, Madison, Egan, and Sofia, 2 great grandchildren: Lila and Otis, plus her dynamic extended family. Heartfelt gratitude goes out to Narciso, Yoly, Tania, Roberto, Raquel and the exceptional team from Ambercare. Mary Alice will be dearly missed and lovingly remembered. My condolences to the family, It was several years ago that her and her husband spent time at Pinewood Terrace before moving back to Florida, RIP . Condolences to the family. Andrew and my brother Terry Pond were friends in their teens. Allison and Segue-my sympathies for your loss. Our sincerest condolences to all the Chakoumakos family. We have very fond memories of Chuck and Mary Alice at UMF. My you all rejoice in lives well spent. It was an honor to know Mary Alice for the short time that I did. I will keep her in my thoughts. Allison, my heart goes out to you and the rest of your family. Our sympathies to the Chakoumakos family. They were so involved in the biathlon, cross-country skiing, music and college events when they were here that they left quite a hole when they departed. We remember them with pleasure as part of the liveliness of the Farmington community in the "early years" of our time here. Mary Alice was such a powerhouse that we know she'll be a sad loss to her children, grandchildren, and the two young "greats"!